AMSTERDAM, 29 March 2012 – SkyTeam, the global airline alliance, has launched a fully refreshed version of SkyTeam.biz, its dedicated website for the travel industry. The site has been upgraded to have a similar look and feel to SkyTeam.com, but is packed with information and tools designed with the travel professional in mind. Initially launched in English and French, SkyTeam.biz will be available in 11 further languages by the end of 2012 including: Chinese (simplified and traditional), Czech, Dutch, German, Italian, Japanese, Korean, Russian, Spanish and Vietnamese. Access to SkyTeam.biz is simple and free for travel agents worldwide. In addition to the latest facts about SkyTeam products and services, the site features the new SkyTeam e-Academy. This new application - developed using travel agents’ feedback - incorporates an e-learning module that provides agents with a step-by-step guided learning experience on how to plan, book and ticket a SkyTeam Go Round the World Pass. Other additions to SkyTeam.biz include an enhanced version of SkyTeam’s Round the World planning application and easy-to-find information on SkyTeam’s Go Passes. 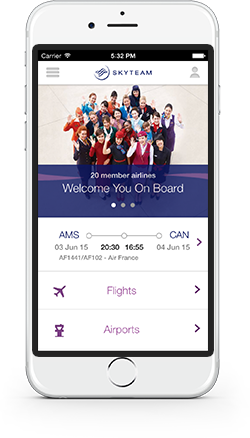 The site also includes updates on SkyTeam’s member airlines and a link to detailed airport lounge information.